I know you must have been on the edge of your seat waiting for the next recap of Ragnar. Well in that case, let’s get to it. Van #1 drove down to Oceanside around 12pm on Friday. Our next set did not start until after 6pm so we knew we would have plenty of time to relax. We grabbed lunch and parked the van in a designated Ragnar parking lot. Over the next few hours, we were able to enjoy time at the beach, tag other team’s vans and relax our legs before our next run. Tagging is a fun activity where each team leaves a team magnet or marks with window paint the other team’s vans. Especially when you are parked in large parking lots of other team vans, it can be fun to walk around and hit as many vans as possible. Team pride is important during Ragnar. Not only do you decorate your own team vans, often have team shirts made, many including our team dress up in costume. Our team name was “Team TBD- Totally Brain Dead” with a zombie theme; our tagline was “will run for brains.” It only seemed fitting as we knew we would be zombies after little sleep, no showers and lots of running. 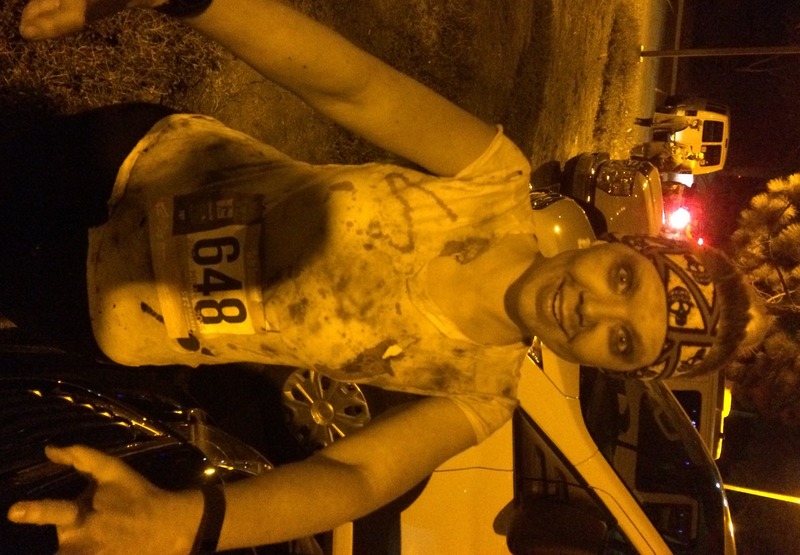 Many of us created tattered, dirty and bloody zombie shirts as our costume to wear during our race. 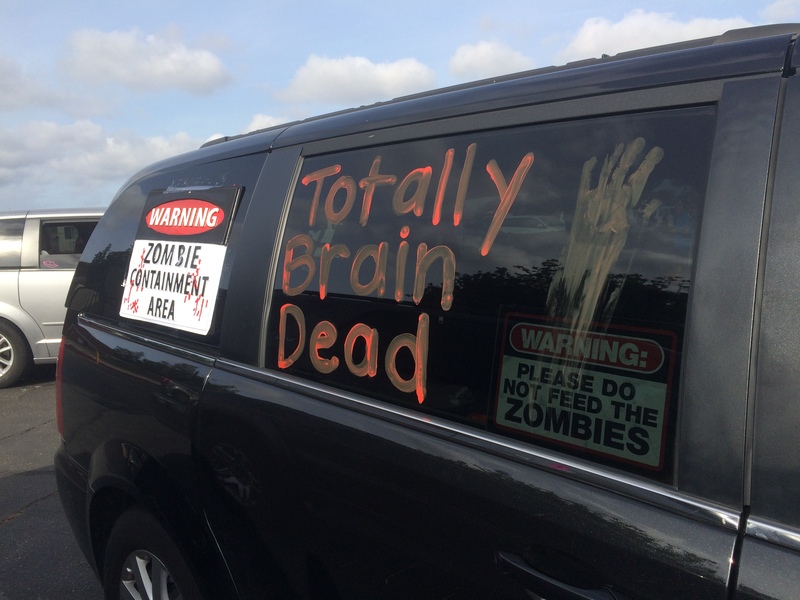 We decorated our van with zombie warnings, caution tape and “bloody” hand prints. Getting in the “zombie” spirit was definitely easy being a Walking Dead fan who had just watched the finale. As we started to approach our next start time we started to organize our van in preparation of getting our next set of running clothes together. Since my next leg would fall after 9pm, I knew I wanted to wear my zombie outfit in the second leg since it was at night. Wouldn’t you want to be running in pitch dark and see a zombie chasing behind you? I dressed in my zombie shirt, skull bandana and safety gear. No zombie look would be complete without lots of dirt and grime on my face. My last leg #18, was 3.0 miles with an easy rating. Within the first half mile, the incline kicked in but the cooler weather was definitely appreciated. Since some of the portions of the race were poorly lit, I was motivated to follow where I could see at least one runner in front of me. At times this kept me faster than my planned pace which I was thrilled about. While I did feel this section warranted a higher rating due to the elevation gain, it was a quick run. As I got closer to the finish line, the crowd got louder and louder. I was thrilled to cross the finish line as the exchange was another fun one to finish since all vans were present. Due to the late hour, we headed out quickly to get to our next exchange to try and catch some sleep before our last run. 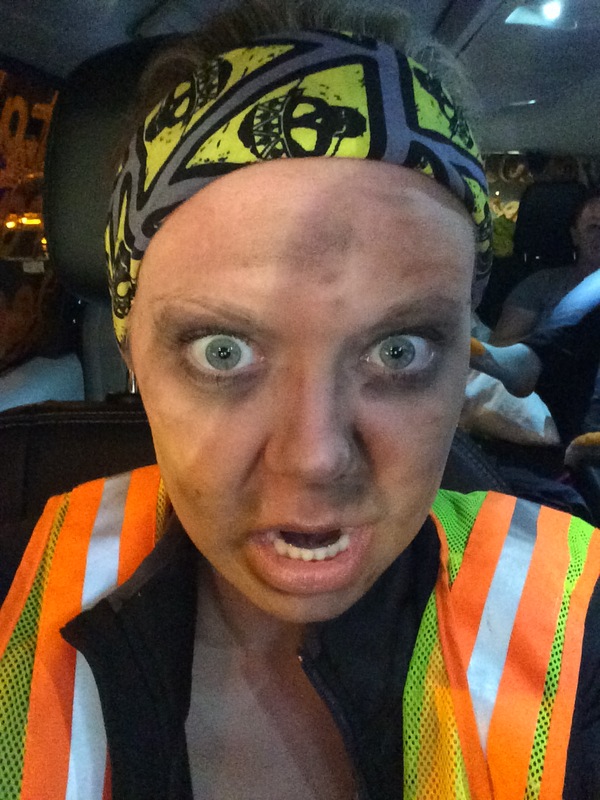 Check back Monday for the final recap of Ragnar. This entry was posted in Fitness, Health, Race, Ragnar, Ragnar Relay, Ragnar SO Cal, Running, Workout, Workouts and tagged Fitness, Health, Race, Ragnar, Ragnar SO Cal, ragnarelay, Running, Workout, Workouts. Bookmark the permalink.